When oil prices drop, critical questions arise as to whether to cut production or even mothball oil and gas facilities. 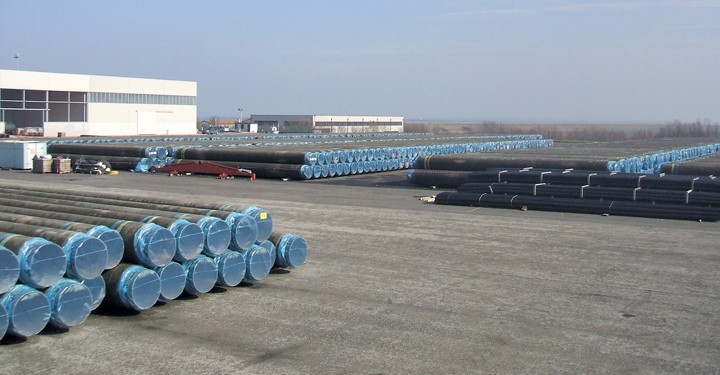 But regardless of market prices, there is always a need to store pipeline components and lay up equipment spares. The critical question is how to keep mothballed facilities or spare parts corrosion free and in peak condition ready for immediate use. Finding corroded parts or equipment at a time of critical need can result in expensive downtime or safety hazards. Therefore, it is crucial to employ preservation methods that promote maximum possible uptime. Across the energy industry, many facilities have discovered how vapor phase corrosion inhibitors (VpCIs) can effectively satisfy these needs. Compared with traditional methods of lay-up, VpCIs are easier to apply and remove, are more environmentally friendly and are more cost effective in the long run. They have been successfully used for lay-up of oil and gas equipment and facilities globally. Protecting facilities from corrosion during mothballing and lay-up is important for minimizing at least three types of losses: 1.) Financial loss from downtime; 2.) Financial loss on operational and critical spare parts deteriorating in a warehouse; and 3.) Financial loss from entire plants and equipment that cannot be restarted, refitted or resold after plant shutdown. In each of these cases, the costs involved can be thousands or even millions of dollars in lost assets and production — not to mention the safety hazards also involved. Too often, the following scenario can occur: A key part fails. Plant personnel go to grab a replacement. The replacement is rusty (perhaps worse than the part being replaced). To install it could mean further failure and safety risks. To wait for a new part could mean days or weeks of downtime. In the case of critical spares — key equipment that seldom fails but takes a long time to order, build, and ship — it could take years. Traditional corrosion protection can be non-existent, ineffective, or clumsy and expensive at best. Some basic methods are to cover exposed surfaces with adhesive films or heavy wax-based coatings. These tend to be only partially effective and difficult to remove. Other common protection methods include nitrogen purges or the use of dehumidification systems. The former method is dangerous, expensive and high-maintenance, requiring daily monitoring to check nitrogen levels. Inevitable nitrogen leakage requires nitrogen replenishment. Dehumidification is only effective in areas with air movement and will fail if there is a power outage. 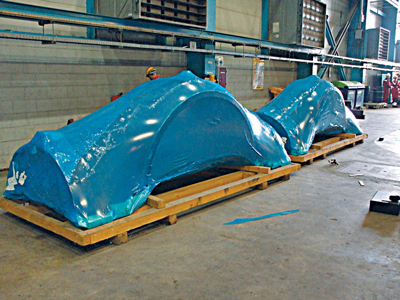 Large equipment like these gas turbine shells can be shrink-wrapped with VpCI film. When the equipment is needed, it is easily unwrapped and ready for immediate installation. While traditional methods are disappointing, major gas and oil producers around the world are embracing the benefits of VpCI technology. This technology works by the release of special VpCI molecules from a source — whether it be packaging, powder, coating or additive material. The vapor abilities of VpCIs allow these protective molecules to diffuse throughout an enclosed space until they reach equilibrium. The VpCIs condense on metal surfaces, forming a hydrophobic layer that neutralizes the electrical surface potential of the metal and protects it from corrosive forces. If the protective layer is damaged, VpCIs present in surrounding voids are attracted to the exposed metal and soon replenish the molecular barrier. VpCI technology has the advantage of working in three phases: the liquid phase, the vapor phase, and at the air-water interface. While traditional protective methods typically work only when applied directly to a metal surface, the multi-phase ability of VpCIs gives it greater flexibility and effectiveness. For example, VpCIs fogged into equipment void spaces can protect even hard to reach areas without direct contact application. Equipment partially filled with fluids can benefit from VpCI additives that not only protect metals in contact with the liquid, but also diffuse throughout the surrounding void space to protect metal surfaces above the level of fluid. The versatility of VpCI means it can be applied to many different kinds of equipment and plant systems. Turbines, pumps, compressors, boilers, generators, gears, and valves all benefit from VpCI protection. Even the return on protecting electrical control boxes can be a significant but sometimes overlooked savings. VpCIs can work directly in lubricating and hydraulic systems, water systems and air systems, as well. off a part, removing VpCI protection is often just a matter of unwrapping a protective VpCI film, using an alkaline cleaner to easily spray off a VpCI removable coating, or doing nothing. For example, removable coatings can often be left on equipment due to a thin clear surface layer that will not interfere with equipment operations. This translates into lower environmental disposal costs and quicker installation of replacement parts with less hassle and downtime. Important oil and gas facilities around the world have found great value in protecting their assets with VpCI. Many companies have thousands or millions of dollars’ worth of warehoused spares that may simply be left to deteriorate through lack of a comprehensive preservation plan. In some cases, the cost of equipment failure and replacement could be a hundred times greater than protecting the equipment from the start. This is an enormous and unnecessary loss. Even when compared with other lay-up methods the ease and effectiveness, greater environmental friendliness and maintenance and reliability improvements of VpCIs help corrosion prevention translate into a significant cost advantage when considering total applied cost. To bring this into perspective, a recent quote for protecting an entire industrial plant with VpCI cost less than a quote for conventional layup of just one piece of equipment. VpCI protection is an excellent way to lay-up spare piping exposed to outdoor elements. While corrosion can be a problem for facilities in any climate, some environments have more exposure to corrosive elements and have an even greater need for corrosion protection. For instance, offshore gas facilities will be at greater risk for corrosion because of constant exposure to a humid, salt spray environment. In one instance, an offshore platform needed to store equipment on deck for one year, where it would be exposed to salt water spray, sand, and shot blasting operations. By using VpCI in its many available forms, it was possible to preserve important equipment such as a mud pump, a B.O.P. unit, and a Top Drive unit, in addition to removing pre-existing rust from various parts. At re-commissioning, parts were simply unwrapped or VpCI foam removed as necessary, sprayed with a VpCI cleaner/degreaser, and surfaces inspected. 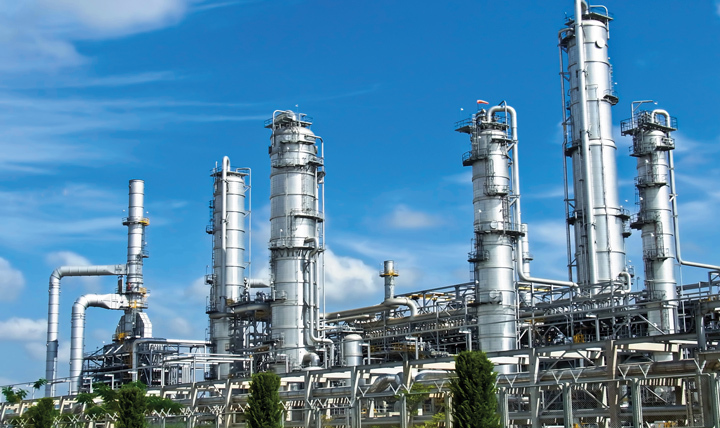 The adoption of VpCIs is becoming more widespread and can be an important turning point in the preservation of gas and oil assets such as spares or mothballed equipment. Not only is it a helpful tool to consider for storing value, but it is an important component in ensuring quick response and intervention in case of parts failure at an operating plant. Too often, the early decision to protect is critical. Julie Holmquist is marketing content writer at Cortec, where she enjoys studying and addressing the many corrosion protection issues of oil, gas, and other industries. Drawing on research and subject matter experts, she communicates the capabilities of VpCI technology in a variety of written forms. Acknowledgements: The author wishes to thank James Holden, P.E., and Bob Boyle of Cortec Corp. for their invaluable firsthand insights into VpCI protection in the oil and gas industry.